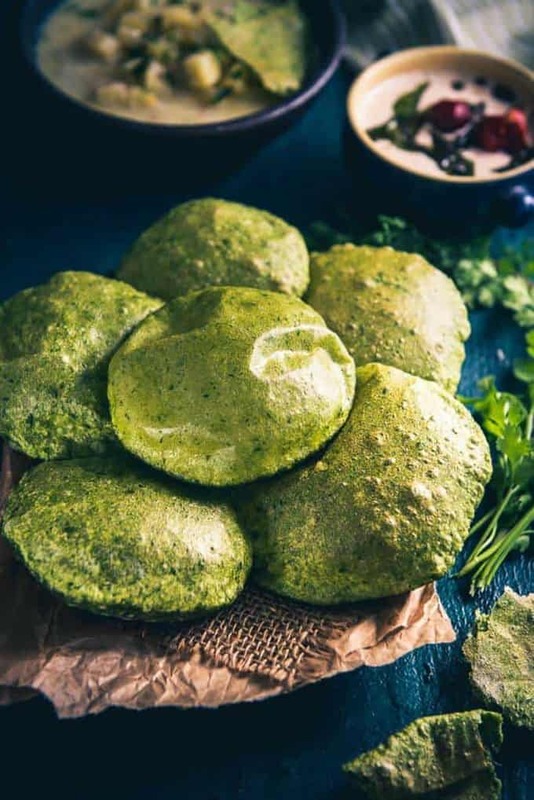 Palak Puri is a healthy and colorful variation of usual Puri where spinach puree is added in the dough. This khasta puri can be eaten as it is and you could even serve it with a sabzi for breakfast. 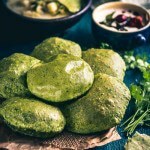 Here is how to make Palak Ki Puri. Puri is a kind of Indian bread made from whole wheat flour which is deeply fried. They turn out fluffy and golden brown. Mostly served as a snack, Puri is also eaten with curries such as Aloo Matar ki Rasedar Sabzi or with Mathura ke Dubki Wale Aloo. Puri even tastes yummy when served with Srikhand or Aamras during special occasions or festivals. Being very simple to prepare, for breakfast, I sometimes make piping hot Puri and serve it along with Til Vale Sookha Aloo which indeed make a soothing combo of Puri Bhaji. Yesterday, out of nowhere, while gardening, I thought, what if we could make more flavourful and colourful Puri? I got this really eccentric thought of making up a combo of spinach and Puri. As I had spinach at home and even some spare time, I ended up making Palak Puri. Though Puri is usually made using wheat flour, I added some Maida in the dough of Palak Puri to make it slightly crisp or khasta. 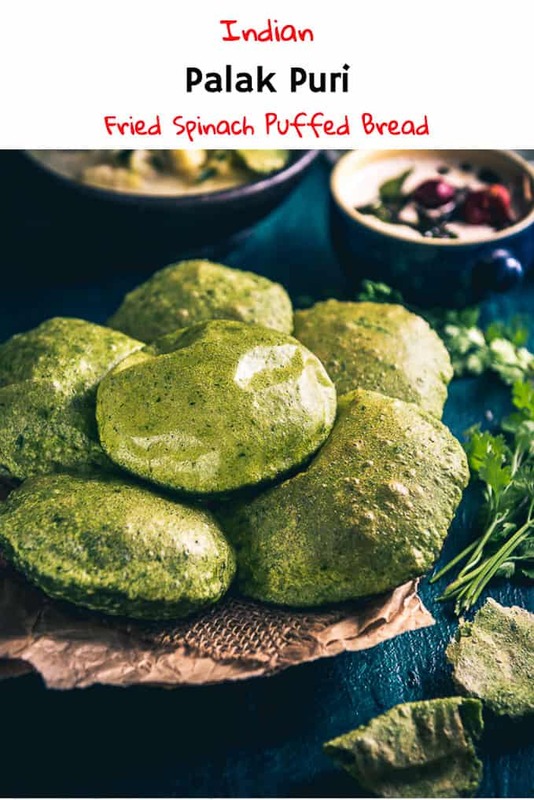 All you need is palak puree, whole wheat flour, maida to form the basic dough. Adding a tbsp of fine suji to the dough makes it even more khasta. To make it taste yummier, you can add a pinch of salt, ginger, green chilli, cumin powder et al. I also add ajwain sometimes to the dough. Once the dough got set, I made small balls out of it and then meticulously rolled Puri. Finally, just deep fried these small, greeny things and Palak Puri got ready! You can use only whole wheat flour to make these puri. Instead of adding spinach puree to the dough, you can add finely chopped spinach. You can add masalas like red chilli powder, carom seeds, hing, chaat masala, lemon juice etc to make this poori even more delicious. Add 1/4 cup besan in the dough to make missi palak puri. 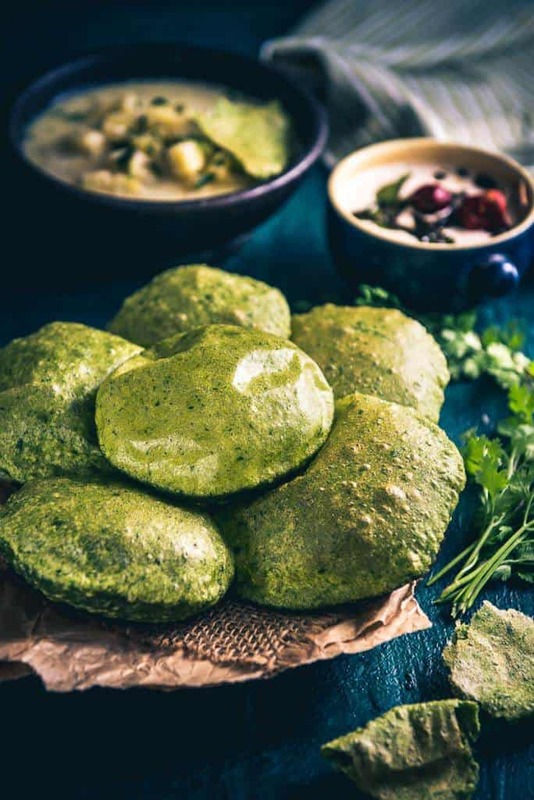 Palak Puri is a healthy and colourful variation of usual Puri. It can eaten as it is and you could even serve it with a sabzi for breakfast. Heat water in a big pan. Once the water comes to a boil, add palak and cook for a minute. Drain the water and run the palak under cold water. Drain the excess water and add the blanched palak in a blender along with ginger and green chilli and make a smooth puree. Add whole wheat flour, maida, roasted cumin powder and salt in a bowl and mix well. Add palak puree and mix well. Make a medium soft dough. Make small balls from the dough and dust and roll to make 3-4 inch puri. Once the oil is hot, deep fry the puries from both the sides.